The natural world exists in delicate equilibrium; the architectural expression of the Circadia pavilion celebrates the tension of this balance, employing asymmetry and the visual power of the cantilever to dramatic effect. Expressed as a legible assemblage of Platonic forms, the pavilion’s constituent parts are dislocated and discrete, relating without visible fixings. Precariousness is manifest; beauty and danger are frozen in a duel. 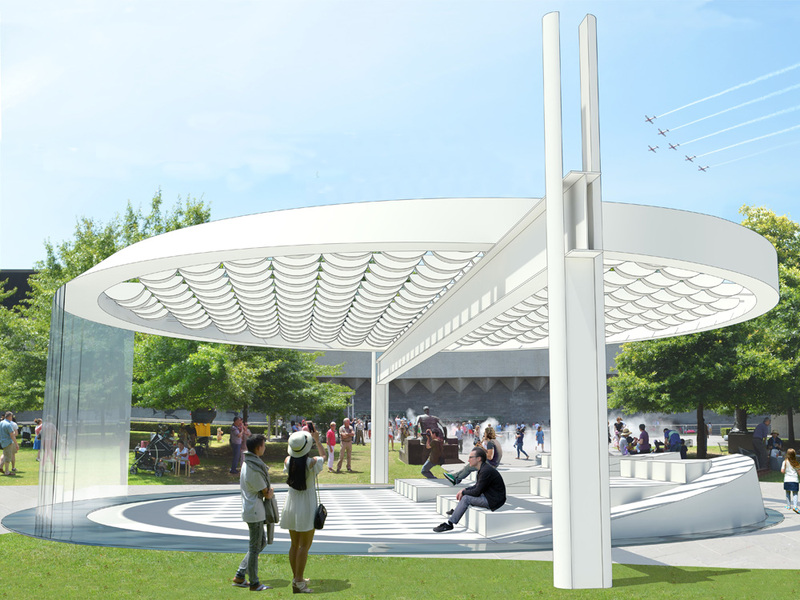 The assemblage comprises a cast of characters: a structural ring of glass-reinforced concrete (GRC) balances atop a Bolte-inspired structural goalpost; folded aluminium ‘petals’ embellish the array of cables that hold the floating ring in tension, rotating freely on their fixings to deliver an abstracted tree canopy, complete with moving shadows. The structural ring – 10 metres in diameter – undulates along its circumference from a vertical to a horizontal taper, the inherent ‘tipping’ exploited by the introduction of a waterfall at its lowest contour. Terraced seating merges with a ramped ground plane within the circular ‘moat’ of shallow water that subscribes to the figure of the structural ring overhead.